Jurgen Klopp has blasted the section of Liverpool fans who attacked the Manchester City bus as it approached Anfield on Wednesday night, branding them “idiots”. The Liverpool boss was giving his pre-match press conference before Liverpool face Everton in the Merseyside derby and seemed disgusted by the behaviour of fans who threw bottles, cans and flares at the City bus. It was certainly more than a “few idiots” as footage has shown, but the behaviour of Liverpool fans, not for the first time, has been highlighted – even by their own manager now. The German was perhaps recalling an attack on the team bus of his former club Borussia Dortmund last year, which saw Spanish defender Marc Batra wounded. 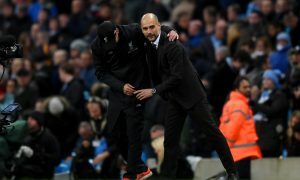 Klopp also thanked Manchester City for stopping their coach so that club medics could help a Liverpool fan who had been the victim of a hit-and-run on the street.